What's up with text messaging? 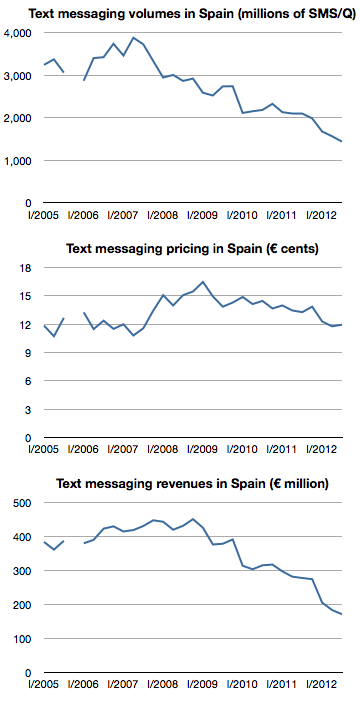 The following graphs show text messaging volumes, pricing and revenues for SMS in Spain. The decline in SMS is coupled with a vast increase in IP-based mobile messaging. Whatsapp reported that it set a record of 18 billion messages processed over New Year’s Eve. In October Apple announced that iMessage had delivered 300 billion messages during the preceding 12 months. Globally SMS traffic is still rising. It’s expected to reach 9.6 trillion in 2012, but at least one analyst forecasts that SMS’s share of global mobile messaging traffic will fall from 64% in 2011, to 42% in 2016. The data from Spain suggests that the drop may happen more quickly than anticipated.